Oil – 6 – 7 tblsp. Potatoes (medium sized) – 5 – 6 nos. Green Chillies – 7 nos. Mint leaves – ½ tblsp. Raw Mango Powder – 3 tsp. or Pomegranate seeds – 2 tsp. Coriander Powder – 4 tsp. 1.) Boil, peel and mash the potatoes. Add salt, asafoetida, the spices, chopped green chillies, finely chopped ginger and chopped coriander and mint leaves. Mix thoroughly and divide into 8 portions, round in shape- the size of small balls. 2.) In a separate vessal, combine refined flour, oil and water to make a soft and sticky dough. Keep it aside for some time. 3.) Divide the dough also into 8 equal portions. Flatten each portion with the palm of your hand and place the potato filling in the centre. Seal the Kachoris properly by extending the dough. Round out the Kachori and flatten it gently. 4.) Heat the oil for frying on a medium flame. When hot, deep fry the Kachoris on a medium flame till they are golden brown in colour. Remove and drain off the excess oil. Kachoris can be served either hot / cold (depending on personal preferences) with Dharan ji Chutney. 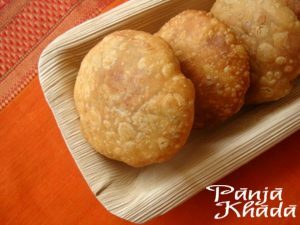 Kachori is a versatile snack – it can be served with any meal as an accompaniment or as a savoury snack. Deepa and Bharat for making life so easy for kids going abroad , now they dont have 2 depend on junk like Burger, Pizza, Noodles….etc. They can have healthy food. Dear Parents don’t you worry anymore we have Bharat to take care of your kids. munjo sabrin ka fav bhatiyo snacks…… Yummy It Mouth Watering…..Yummy….